BTS : We Hired a Team! — Champagne Supply Co.
BTS : We Hired a Team! 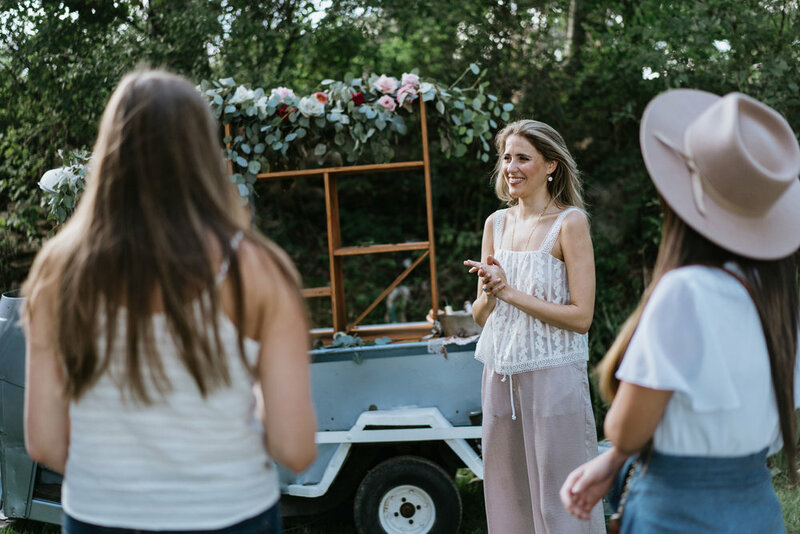 A huge goal for our company is for our culture to exude values of support, longevity, authentic relationships and that your BIG day is a GREAT day. But, not your greatest day. We want to bring value to events, we want our clients to remember the experience with not just the truck but with our team. Welcome to a recap of our first training day with our new team of Champagne Attendants! We started as a family business, our parents have helped build everything about our company. So when it came time to train our team of Champagne Attendants, there wasn’t a better place than The Hatton House Bed & Breakfast owned by Ana’s parents DorRae and Bobby. The view from the house is the definition of the Texas Hill Country! Full disclosure, it was really hard for us to get to a place where hiring was possible. Between our full time jobs and long distance business planning, getting our brains around how to train someone on our little operation was daunting. When we first posted our call for Attendants, we had no idea the response we would get. 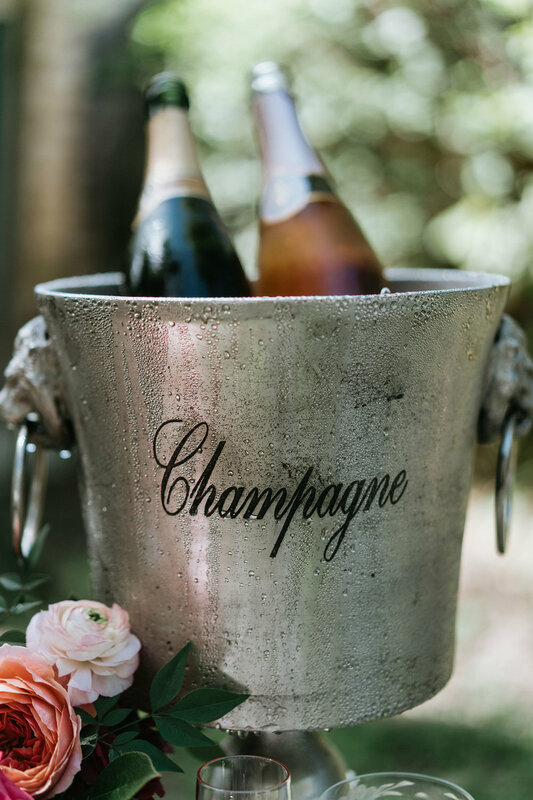 We wanted to find people who loved champagne as much as we do, but also who love to bring an element of an unforgettable surprise to someone’s event. After the first few emails went out to friends of friends, it didn’t take long for friends of their friends to reach out with interest! 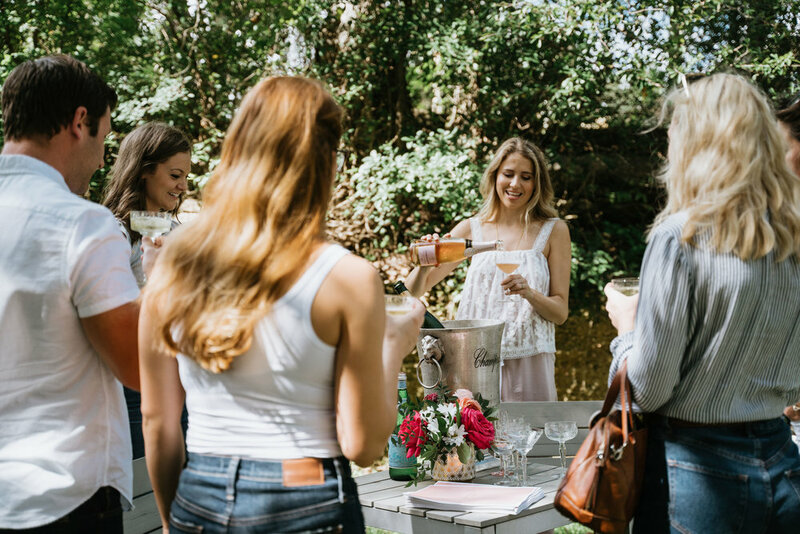 Hospitality is our number one priority so it was only fitting to welcome everyone with a glass of bubbly and ease some “first day jitters…” Including our’s! Our goal is to bring our clients an experience that leaves them saying, “Did that just happen? Was I just served a glass of bubbles from a tiny truck? 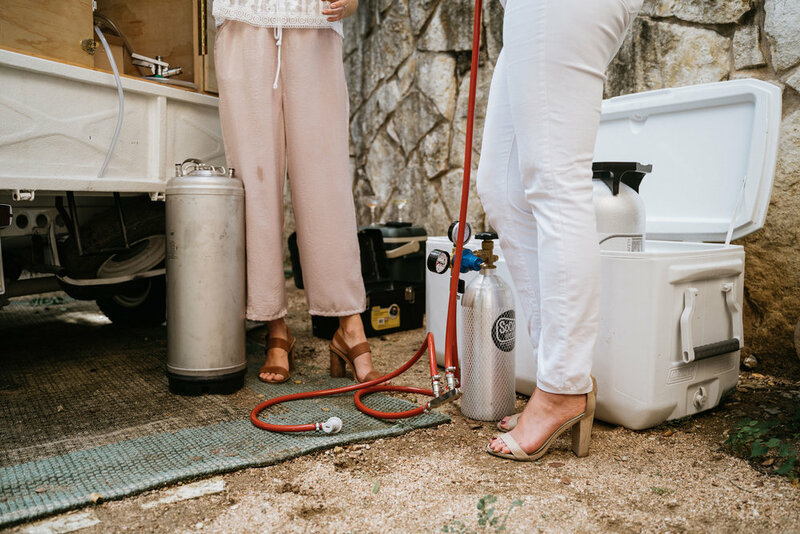 On Tap?” Our answer is “YES! You did! !” But getting there does take us a few steps. … And a couple of tools! When you’re building a brand, it is important to have a consistent appearance. 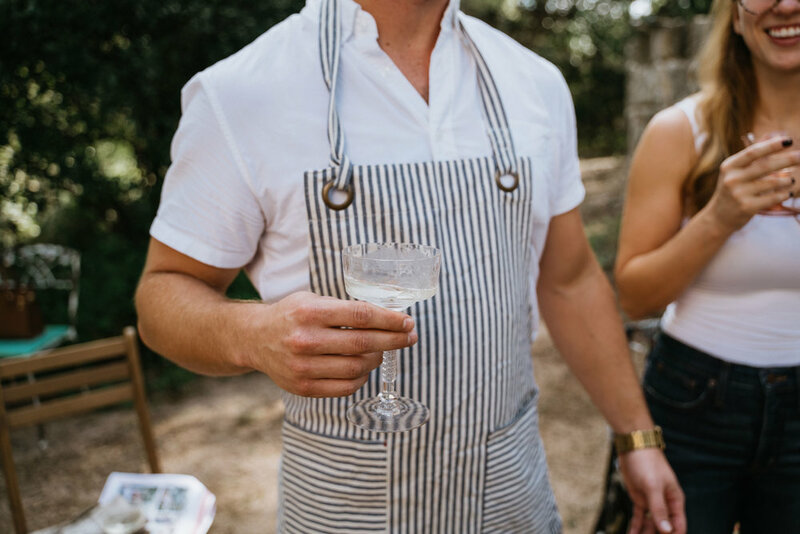 These aprons we found were the perfect solution to a uniform piece. Ryan is our resident Firefighter who pops bottles with us on his days off. Hi apron came in wrong BUT we think he’s the perfect fit! Don’t worry Ryan, your’s will be in shop before your next event! 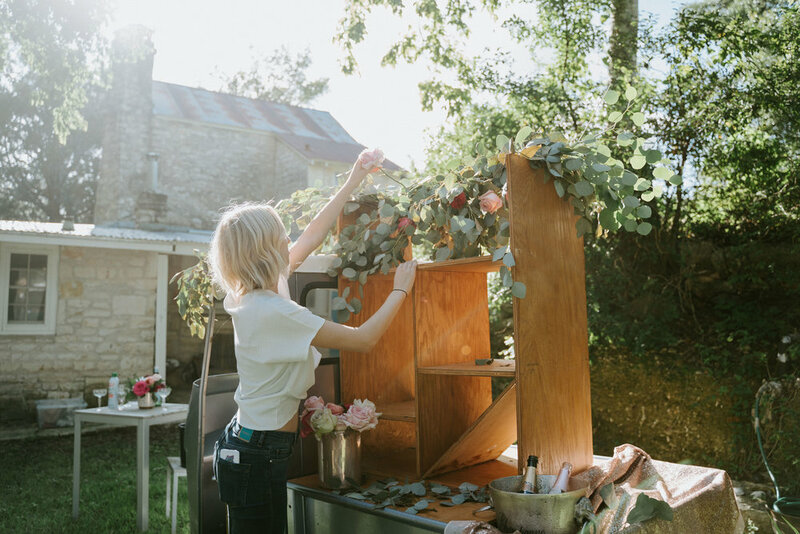 One last stop before the day’s end is a visit to the Cushman for a little styling lesson and play with eucalyptus and flowers!